When I got to my new library last Friday, I found out I had 8 classes that day and all the “Welcome to the Library!” books I like to use weren’t in the collection. 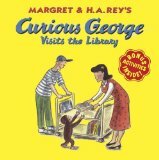 Curious George Visits the Library was the first one I found, so I read that book with all my pre-K, K, 1, and 2 classes this week. It’s not my favorite book, but the kids enjoyed it and I used it to reinforce good behavior (“Boys and girls, do you think it’s a good idea for George to ride a book cart through the library?”). I’ve now seen every class to do seating assignments, go over rules and behavior in the library, and do a quick taking-care-of-books refresher. Then I read this book, and if the class could sit still enough I also read Don’t Let the Pigeon Drive the Bus! and The Pigeon Finds a Hot Dog, which were huge hits. Some of the classes checked out books, but a lot of them took a little longer to get the hang of rules and seats. With the older kids, I gave them a survey that my mentor Dee gave me. I tweaked the questions for my kids’ reading levels, and basically it just asked them what they like to read, where, how they pick books, and what they like about coming to the library. I’m currently trying to figure out exactly what to do with my classes tomorrow (Friday is my busiest day of the week). They are a week ahead of everyone else because I started on a Friday. But my plans for next week aren’t ready yet. I want to get library cards made for all the kids and let them decorate them. I want to make the cards a big deal, like an event. Even for the 5th graders. But I still have to get all their homerooms updated and barcodes printed out in Follett Destiny, so that’s not going to happen tomorrow. I think I will end up playing games with the kids and getting some of the older ones to help me decorate the library for fall. 2nd Graders Come To the Library!